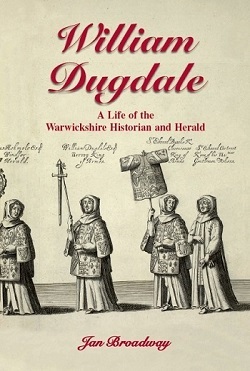 William Dugdale (1605-1686) was born, lived throughout his life and died in the same village in north Warwickshire. His life, however, was far from the static rural idyll that this implies. Despite having only a rudimentary formal education, by his early thirties Dugdale was accepted as a local authority on medieval history and manorial law. He then established himself within the antiquarian community in London, supported by the acquisition of a post in the College of Arms. Throughout the civil war he was part of the king's administrative machine in Oxford, while his wife and family remained on his estate in Warwickshire within the shadow of a parliamentary garrison. After the royalist surrender he returned to his scholarly pursuits and published his first historical works during the Interregnum: The Monasticon Anglicanum with Roger Dodsworth (1655), The Antiquities of Warwickshire (1656) and The History of St Paul's (1658). He was a self-publisher: he bought the paper, organised the printing and distributed the copies, financing his ventures by persuading subscribers to pay for the engravings that enhanced his works. At the same time he remained in close contact with royalist opposition circles. At the Restoration Dugdale returned to the College of Arms as Norroy king at arms, while continuing his publishing career. He began the immense task of visiting all of the counties of northern England to record the pedigrees and coats of arms of the local gentry. His work was hampered by the plague of 1665, but he completed his final journey of the visitation in the late summer of 1666. As he travelled south from Northumberland he learnt that the Great Fire had destroyed the College of Arms and all the stocks of his books that were stored there. Thereafter he allowed others to take the commercial risk of publishing his Baronage (1675-6) and other works, although he chafed at his loss of control. In 1676 he was ready to retire, when chance led to his promotion to Garter king of arms and a knighthood. Despite increasing age and frailty he continued to publish and to exercise his office until the end of his long life a decade later. Jan's biography draws on the extensive archives relating to William Dugdale to be found in London, Oxford, Warwickshire and elsewhere across England and especially on the large number of letters written to and by him that survive.